A new Závecz Research poll shows that Fidesz support is down by one percent, while the number of Hungarians who would like a change in government rose by three percent, from 40% to 43%, based on polling data gathered in February. It’s worth noting that this was the last poll conducted prior to the official launch of the election campaign. We will see in upcoming polls if active campaigning changes voting intentions. According to the most recent numbers among decided voters, Fidesz support stands at 51%, while Jobbik is at 17%, the Hungarian Socialist Party-Párbeszéd (MSZP-P) alliance is at 13%, the Democratic Coalition at 8% and Politics Can Be Different at 6%. No other party comes close to the 5% threshold necessary to enter parliament. Of the 3.5 million Hungarians who would like to see a change in government, 70% support one of the parties in the fragmented opposition, while approximately 30% (around 1 million Hungarians) do not have a party that they are comfortable supporting. It is likely that many of these voters will not cast a ballot on 8 April. Currently 37% of the electorate would prefer to see Prime Minister Viktor Orbán’s party stay in power. The parties that have the most determined voters (the ones most likely to vote) are Fidesz, the Democratic Coalition and Jobbik. In each case, 60% of their voters say that they are certain to vote on 8 April. This compares to 56% for both MSZP-P and LMP. It is perhaps not surprising that MSZP’s voting base is more uncertain. As some political observers have pointed out, no party has experienced as much radical shifts and turmoil as MSZP, since last fall, when it’s candidate for prime minister, László Botka, resigned and more recently since finding Karácsony Gergely, who has real no history with MSZP, to lead the new MSZP-P alliance in April. Another poll, this one by Publicus, also sees Fidesz weakening in most demographic cohorts. In fact, Fidesz appears to be very weak among the youth. In the case of Hungarians between 18 and 29 years of age, Fidesz support stands at just 10%. Fully 80% of Hungarians in their twenties want to see a change in government. 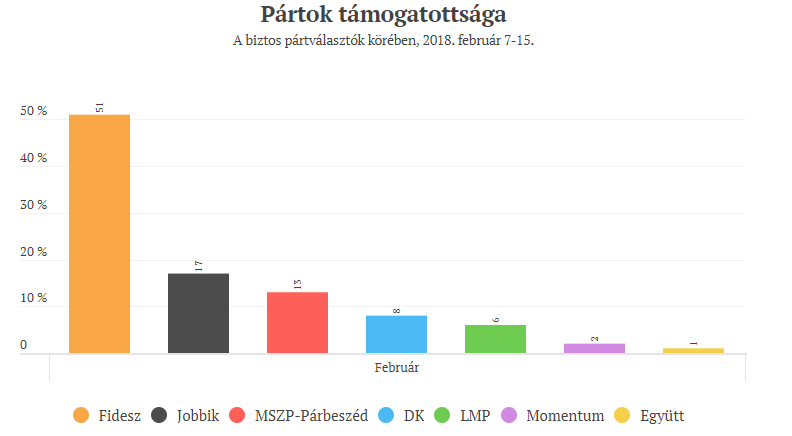 The Publicus poll has Fidesz support at 48%, followed by MSZP at 18%, Jobbik at 16%, LMP with 8% and DK coming in at 5%. Political parties and candidates in single member constituencies have spent the past three days busily collecting the necessary 500 signatures per electoral district to run in the elections. Fidesz and MSZP-P have been the fastest in collecting the required number of signatures. Fidesz’s leadership demanded that its candidates finish collecting all 500 valid signatures in each of the 2016 electoral districts by Tuesday, while MSZP-P confirmed that they will have completed this task by Friday, in the districts in which they are fielding candidates and not supporting one nominated by DK. I am hearing, however, that a deep sense of political apathy, particularly among younger voters, is prevalent throughout the country and this is made apparent to candidates as they go from door to door. Hungarian youth, and other demographics too, have simply disengaged from political discourse. A few decades ago, there was a term for a somewhat similar phenomenon in Hungary: it was called internal emigration and it helped the regime retain power. Reporting from the scene, as it were, I would certainly concur the level of apathy towards the election is the highest I have seen for two decades. That, I would have thought, is in the regime’s interest as their voter base, in contrast to that of the democratic opposition, tends to be fanatical (the cruel would even argue “unthinking”) and will vote whatever. The “young” “hate” Fidesz? Yes, probably but not enough to do anything about it, apart from (rather ironically) becoming economic refugees and moving to the West. In unis like ELTE, Debrecen and Corvinus, the Fidesz Elite are seen as fat (metaphorically and literally), corrupt and seriously uncool and the radical Far Right would hold far more sway amongst the student body. But in reality it is only the single issues (internet tax; Sunday opening, the Budapest Olympics) which have the potential to bring thousands of anti-regime youth unto the streets. BTW, so far, I have seen not one MSZP poster, canvasser, sticker, letter anywhere. They have given up and in all honesty, good riddance if they have- for the most part a bunch of corrupt wannabe opportunists who wouldn’t recognise true socialism if it hit them in the face with a sledge hammer. 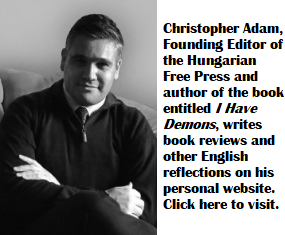 The problem for Hungary, and for many of the former members of the Soviet Empire is, that the networks, structures and culture of participatory democracy, based on respect for justice, constitutionalism and the pursuit of sustainable economic development is very weak. This leaves the door open to the criminal illusionists like Orbán, or his puppet master, Putin, to wipe out the critical media, the system of checks and balances on autocratic power, wipe out the rule of law, in order to create the fantasy-land that seems to be gathering strength everywhere. Check out Larry Diamond’s article in the American Interest. Diamond is no Marxist, but a member of the Hudson Institute, a Conservative think tank and the editor of the highly respected Journal of Democracy. (I say this to the trolls like “peter” who congregate in the basement of this portal to pollute the space with their unsustainable lies).